Rainbow Party leader Wynter Kabimba has made a starling allegation that the leaders of the newly-formed Socialist Party broke away from his party because he did not subscribe to their atheistic beliefs and plans to source funding from gay rights organisations. But Socialist Party leader Cosmas Musumali, who was Kabimba’s running mate in the 2016 general elections, dismissed the allegations as lies but was quick to add that he has no intention of engaging in a mud fight with his former boss. The Socialist Party was launched on March 31 with veteran journalist Fred M’membe being announced as the party’s 2021 presidential candidate and deputy general secretary, while Dr Musumali is the party’s general secretary. Commenting on the formation of the breakaway party, Kabimba, an erstwhile close friend and political ally of Dr M’membe, said while he wishes the Socialist Party well, the public needed to know what led to its split from the Rainbow Party. “So, this is the story as it has been told and you know, it is very interesting that what goes round comes round. So, I was laughing to myself as I watched the clip of former colleagues in the Rainbow Party being paraded that these are men of integrity, that these are honest men. I have just been listening to Cosmas Musumali’s interview on Radio Phoenix as I was driving to the studio…. So, we wish them well. But let me go further because this issue needs to be clarified, once and for all. Why did we have differences in the Rainbow Party with our colleagues? Firstly, we disagreed with the type of people that they wanted to bring into the party (Rainbow Party) as financiers. We disagreed with their (party financiers) sexual orientation! We are not so desperate that we can get money from anybody into the political party,” Kabimba said on The Interview programme on Millennium Radio. But Dr Musumali rubbished Kabimba’s claims, adding that he did not wad to be dragged into politics of character assassination. 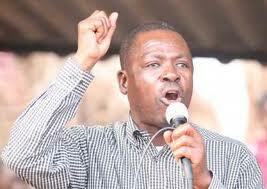 “The reasons comrade Wynter Kabimba is advancing are unfounded, they are lies and they are shameful. It’s high time we moved to a political discourse of respect and of honesty and his statement falls short of that,” he said. “I don’t want to be dragged into the issue of character assassinations, into issues where we start dragging each other’s names into the mud – I haven’t done it with him and I will not do it with anyone else. That’s not the Zambia we want to build. Zambians don’t deserve to be told lies, they don’t deserve to be given statements by our leaders that will not build this country,” stated Dr Musumali. On Kabimba’s claims that his party wanted to advance an atheistic agenda, Dr Musumali said issues of religious belief are better left to individuals.